A very stable trajectory over rolling hills with multiple wind shifts, this can be the great equalizer on a moderately sized game animal hunt when weather or animal size can’t be too predictable. 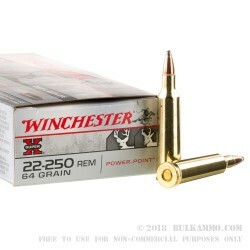 This is an excellent 22-250 round on the super-fast low grain weight side of the medium and smaller large game hunting spectrum. 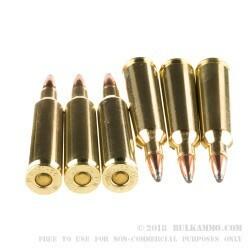 It is also a go-to for varmint work or small predatory animals when you need to be able to reach out past 200 yards. This Winchester Super-X round is a great early deer season round that is more than capable of landing the smaller and moderately sized deer (make sure you have regulations that put this smaller diameter projectile squarely in the sanctioned area). 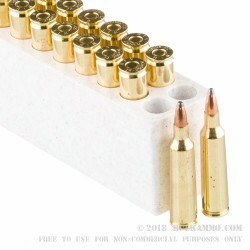 Overall though, for those who have seen the merits of this flat shooting, wind-shedding caliber it is a very good round to have around for a variety of purposes, especially target shooting and small game related. The ample speed to grain weight to power metric of the .22-250 lends well to anything from prairie dogs to deer and antelope. 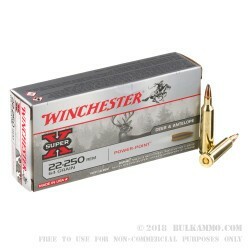 The 3500 feet per second velocity for this Winchester load makes it about mid-range for the .22-250 in the spectrum of available loads.